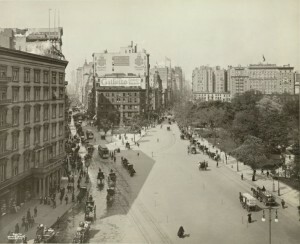 By the date of this photo (1890), the Fifth Avenue Hotel, facing Madison Square Park, had already seen its share of American political drama. The double-breasted, cigar-chewing gentlemen who gathered in the sumptuous rooms of the Fifth Avenue Hotel were occasional connoisseurs of New York City history, and in particular, these amateur historians spoke of the very street corner where their hotel stood. Before Madison Square, when the area was a barren parade ground, one Corporal Thompson opened a roadhouse and stagecoach station in the area that was to become 23rd Street and and Fifth Avenue. Many spoke fondly of Thompson’s establishment, called Madison Cottage, because they remembered the place as young boys. They recalled the area’s rural quality, with carved rectangular blocks carved into the land and a dirt-road Broadway meandering north. But that was the 1840s. Forty years later, Madison Square Park was the center of New York, a focal point of class, business and luxury that stretched south to Union Square, through that attractive collection of fine stores known as Ladies Mile, and up Fifth Avenue into the fabulous mansions of the rich. 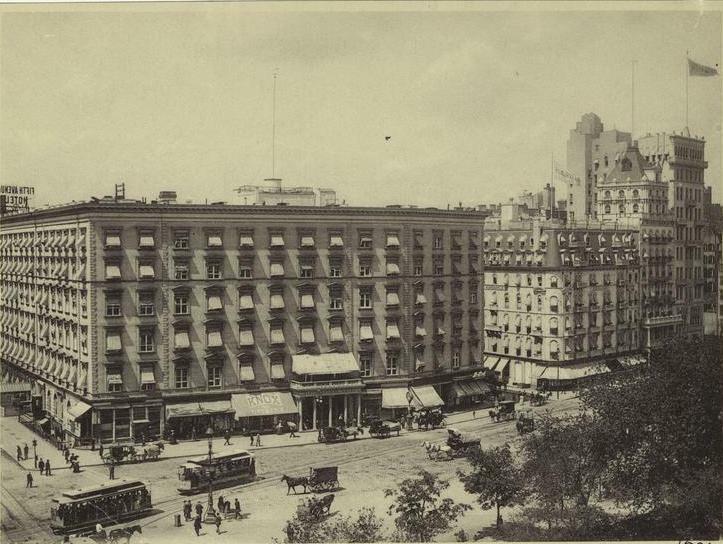 And dead center of all that activity was the Fifth Avenue Hotel, not only the “finest [hotel] in this metropolis”, the “leading hotel of the world ,” but quite simply one of the most surprising stages for American politics of the mid and late 19th century. Hotels were fast becoming the center of New York life from at least the days of the Astor House, located near City Hall, in the 1830s. 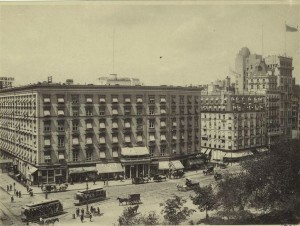 Within two decades, trendy new hotels (such as the St. Nicholas and the Metropolitan) spread up along Broadway and eventually clustered around Union Square. By the Civil War, the thrust of New York society was so defined by them that Confederate conspirators tried setting fire to a several of them. The Fifth Avenue Hotel opened in 1859, the venture of wealthy merchant Amos Richards Eno, who accurately gambled that the center of city commerce would soon settle at 23rd Street. So confident a speculator was Eno that he moved from his brownstone at 74 Broadway (the first New York brownstone, he claimed) to a massive home nearby the hotel. Some thought it unwise to build so far north, and when workers unearthed dozens of skeletons during construction — the area once being a potter’s field — the corner was even considered cursed. Eno defied the naysayers, pouring his wealth into the hotel to make it the most modern, most luxurious accommodation of the day. As the finest hotel in the city in the post Civil War years, it naturally became a magnet for politicians and financiers. Of all the ‘backrooms’ of American politics, none were as gleaming as the Fifth Avenue. Bankers huddled in the legendary ‘parlor D. R.’ during the tense days of the financial panic of 1873. In particular, the hotel became a de facto headquarters for New York Republicans. While often secondary to the city’s Democrats — this being the era of Tammany Hall‘s swelling power — Republicans were frequently in control of state government, and the Fifth Avenue Hotel became a smoky center of political wheeling and dealing. During the 1870s, New York republicans became national power brokers and frequently hashed out crises here at the Fifth Avenue. In the years before the Waldorf-Astoria, presidents and dignitaries all stayed here during visits. Seamier political maneuvers took place in the chambers of prominent politicians who held court here, including the inimitable Roscoe Conkling (at left), senator of New York and leader of the Republican faction known as the Stalwarts. 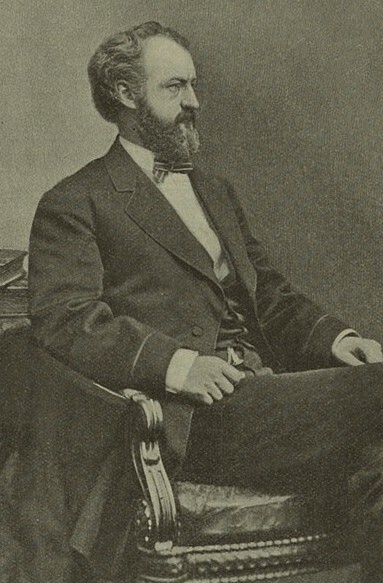 Another frequent guest here was Chester A. Arthur, Garfield’s eventual vice president. When Arthur became president after Garfield’s assassination by Charles Guiteau (who had himself wandered the hotel’s hallways in delusion), he would set up his entire administration here during visits to his adopted city. By the 1890s, a corridor of the hotel known as the ‘Amen Corner‘ was a famous congregation spot for Republican political bosses and reporters. As they frequently powwowed here on Sundays, gatherers would caustically shout ‘Amen!’ during heated discussions. The hotel became a magnet for shenanigans of all varieties. In 1893, a couple hundred proponents of a U.S. monetary silver standard erupted into a riot that included two U.S. senators. The bank robber Robert Montague was arrested here in 1896 thanks to a tip-off from a chambermaid. An early vestige of baseball’s National League met here annually, and the national pool competitions were held in the hotel’s billiard room. By the new century, of course, the locus of New York activity was hastily moving uptown, and the Fifth Avenue Hotel was deemed a relic, even as a brand new structure across the street — the Flatiron Building — was being proclaimed the finest building in the city. In 1908 the Fifth Avenue Hotel was torn down and replaced by the 16-story Toy Center (called the Fifth Avenue Building back in the day), the epicenter of toy manufacturing for much of the 20th century.